A Gunite inground pool is typically the most preferred construction type sought after by future Pool Owners. The design possibilities with a Gunite pool are near limitless and Gunite pools have some of the most popular and desired features seen today. These include infinity and vanishing edges, custom sundecks and benches and spectacular tile and interior finishes found only in this type of pool construction. Gunite pools also have one of the strongest structural warranties when compared to any other pool type. If you are looking for something one of a kind, a Gunite pool may offer the answer to all of your needs. So what is a Gunite pool? For starters, a Gunite inground pool is comprised of strategically placed, hand installed, steel rebar reinforcement that acts as skeleton of your pool. Once this reinforcement is in place, pneumatically applied concrete or “gunite” is shot into place by team of highly skilled professionals and then hand sculpted to the design of the pool. Upon completion of the gunite process you will then see your one of a kind pool start to come to life. Shortly thereafter, a tile border will be installed around the entire perimeter of the pool. Then the interior finish will be applied to the pool to give it that truly exquisite look found only in a Gunite pool. Every Seasonal World Gunite pool is backed by a Limited Lifetime Structural Warranty. This provides the peace of mind knowing that your swimming pool structure is built to last. A member of the Seasonal World Team will be more than happy to share more warranty information with you or answer any questions that you may have. Everything has its up and downs, its good and bad, its positives and negatives… Well you get the idea. See the side by side breakdown of the biggest pros and cons of ownership of a Gunite pool. Strongest type of inground pool construction available when compared to all types. These types of pools are the fully customizable and near limitless with respect to size, shape and features. Suitable for the most difficult backyard installations. Unique interior finish options that can only be installed in conjunction with this pool type. Slightly longer installation timeframe when compared to other pool types. Higher initial investment to build. Higher long term cost of ownership in most situations. Gunite inground pool construction is typically on the higher end of the price spectrum when it comes to the different inground pools available in the marketplace. With this type of construction the pricing will vary depending on the options and features that will ultimately make up your purchase. On average, a Seasonal World Gunite pools will start around $39,995 - $46,995 from small to medium sized pools. A larger Gunite pool will typically range from $46,995 to $53,995. The more involved or more complex project along with the choice and quality of specific features will also affect where your final project comes in at. Again, the overall price of your project will vary due to the options and features that you may add into your final decision. Watch the complete installation of a Gunite pool at a recent project completed by Seasonal World. This video installation shows a backyard from start to finish and the amazing transformation that takes place in a short period of time. See our team of professionals take pride in their work while they make the dream of pool ownership a reality for another family! Click here to see tons of actual Gunite Pool Projects that Seasonal World has completed. The virtual design was what really sold us on Seasonal World. We could see what we were getting before we commit to it. Installed in just one day and the lowest cost of ownership! Who could ask for more? 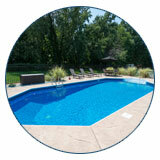 See why Seasonal World is the leader in fiberglass pool installations.